It's birthday month here on Hummingbird High! I am turning 30 next week and I am celebrating each week with a birthday cake themed baked good. Think: lots of classic birthday cake flavors like yellow cake, vanilla, and of course, sprinkles! I am usually not a birthday person, but 30 seems like a number too significant to ignore. I initially wanted to splurge and go to Montreal, but since I never have enough vacation hours saved at work and our time in New York is limited (more on that later), I am perfectly content to stay here in the city. Erlend and I will be shelling out for dinner at Momofuku Ko and then heading to Le Coucou with his parents; his dad's birthday happens to fall on the day after mine, so it will be a co-birthday celebration! 1. I've got a week left in my 20s — anything I should check off on my bucket list? Like, should I go skydiving? Try and snag a last minute reservation to Per Se's 30 for 30 dinner? Get a tattoo? Get bottle service (ew)? 2. Any words of general advice? There's lots of scary urban myths out there about milestones I should have already achieved, things I should plan for, and my changing body (lol, seriously — apparently my metabolism will basically be nonexistent, and all the skincare I neglected to do in my 20s will now apparently be immediately visible on my face). But surely it can't all be doom and gloom, right? 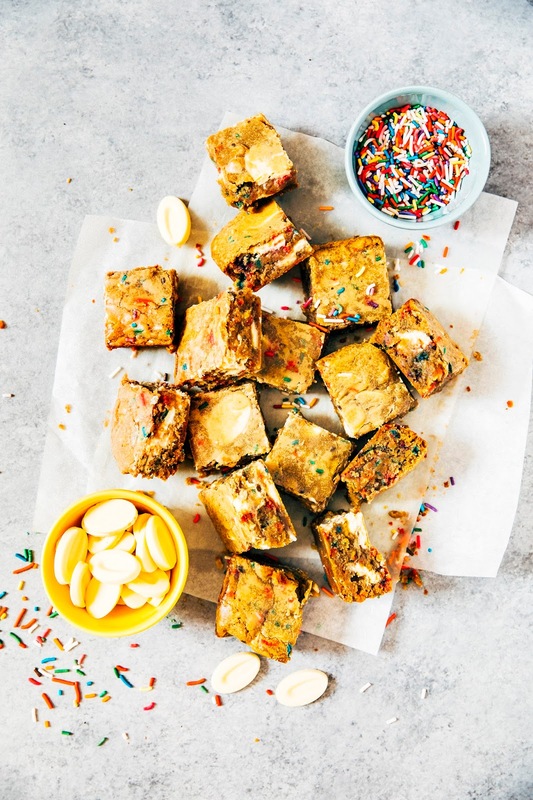 As for everybody else, help me celebrate my birthday with these birthday cake blondies! 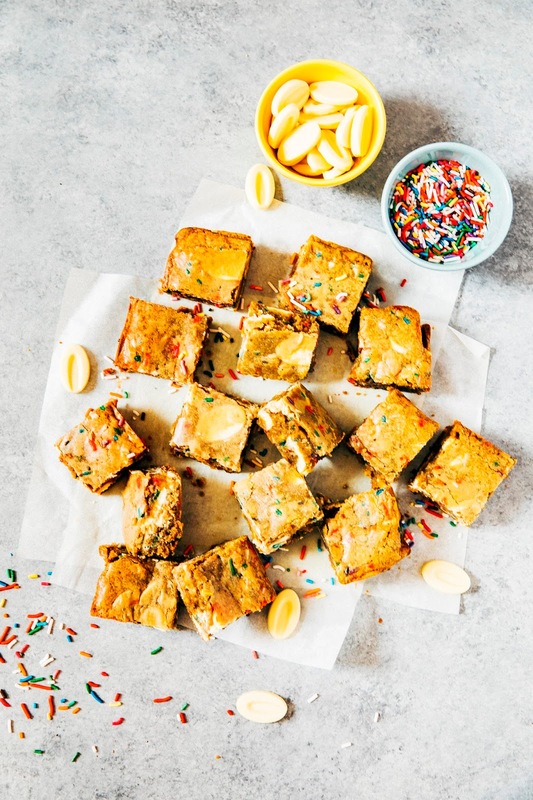 These are a variation of my favorite brown butter blondie recipe on Food52. 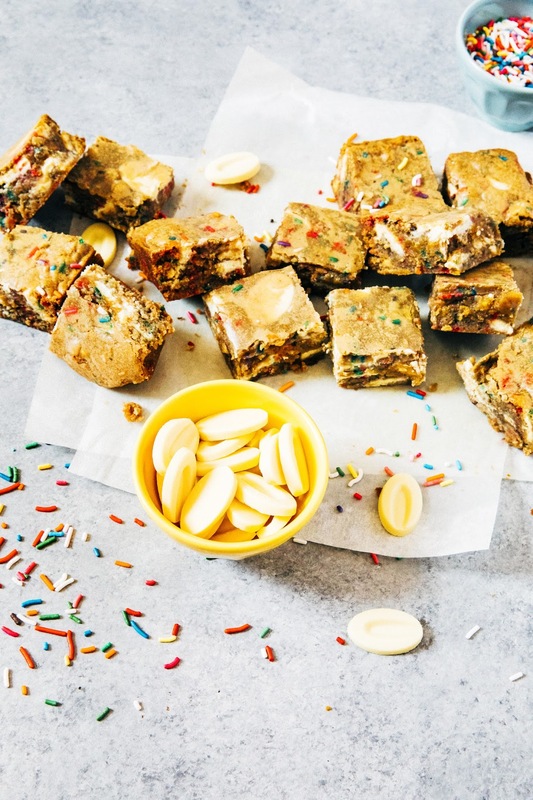 I've swapped out the chocolate for white chocolate (an homage to my favorite Compartes bar and its Trader Joe's knock-off), and thrown in a generous portion of sprinkles for good measure. I also use clear (ehem, imitation) vanilla extract to give it a boost of the funfetti box mix cake flavor we all know and love. 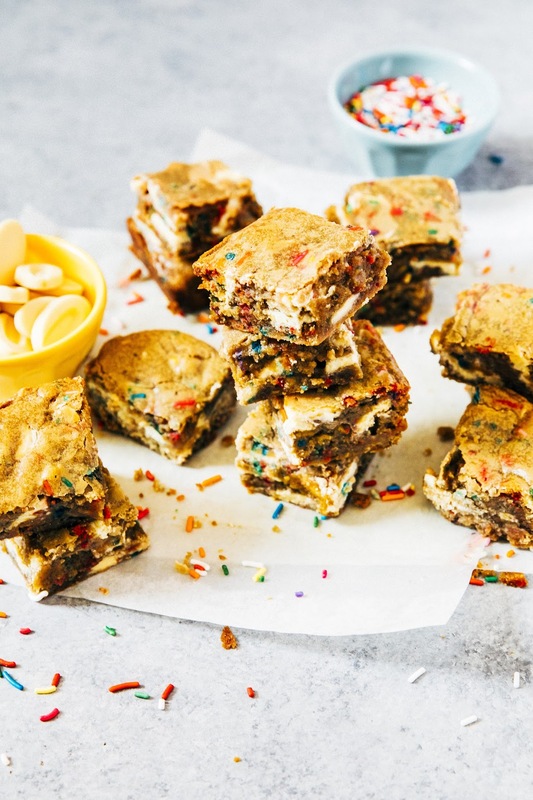 If birthday cake came in cookie bar format, these blondies would be it. Enjoy! Since this recipe doesn't have too many ingredients in it, it's important to really use high quality ones. 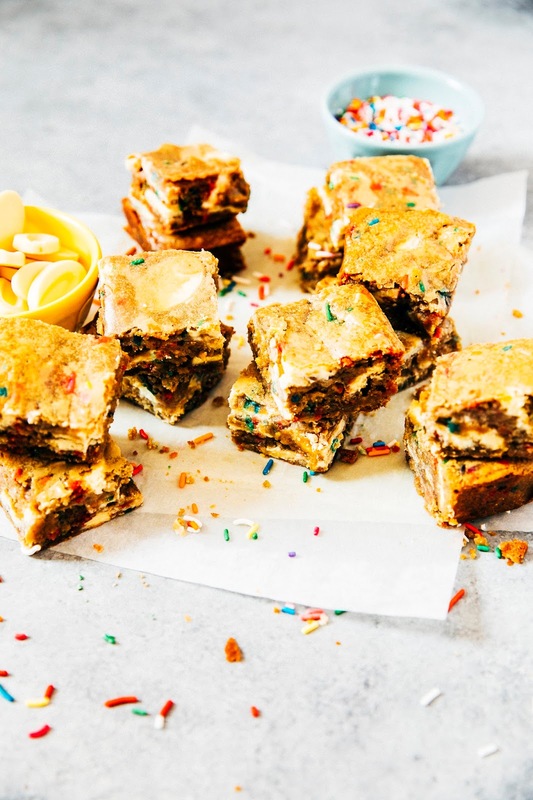 Opt for the best quality butter, white chocolate (I used Valrhona feves, but honestly chocolate chips might give you a better chocolate-per-bite ratio), and non-waxy sprinkles (if you're feeling ambitious, make your own!). For vanilla, I used the clear, artificial kind that you can find at almost every supermarket in the U.S. for cheap. 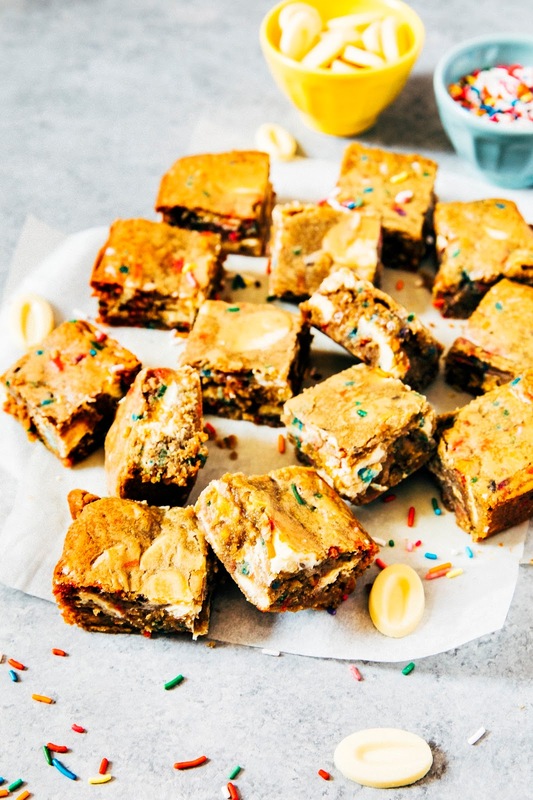 It seems counterintuitive to use cheap vanilla after the advice I just gave, but I learned this trick from Momofuku Milk Bar years ago — cheap vanilla extract is what gives you the funfetti birthday cake flavor from your childhood. Real talk: it took me a long time to figure out how to brown butter. For a long time, I was actually just melting butter, thinking it was brown butter, and not knowing what the big deal was. I know, I’m stupid, lol. But seriously — to do it right, it often takes longer than you think it will, so trust the recipe. Use low heat and a light-colored pot so you can see what’s happening. And trust your nose — the smell of browned butter is nutty, wonderful, unique, and unmistakable. If you don’t smell anything, you’re just not there yet. Here’s a great post from Serious Eats for visual guidance of the process. 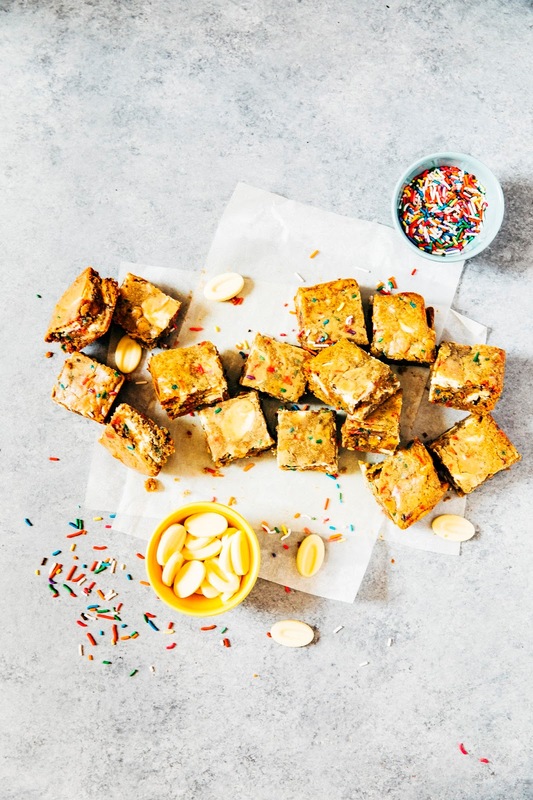 Once the butter has cooled, it's time to make the blondies! Center a rack in the oven and preheat to 350 (F). Prepare an 8 by 8-inch square baking pan by spraying with a light coating of cooking spray. Line the bottom and sides of the pan with parchment paper (Food52 has a great guide on how to do this perfectly). Set aside. In a medium bowl, whisk together 2 cups all-purpose flour, 1/3 "heaping" cup rainbow sprinkles, and 1 teaspoon kosher salt until well combined. Set aside. Remove the bowl from the freestanding electric mixer and scatter 12 ounces white chocolate feves over the batter. Use a heatproof rubber spatula to hand mix the chocolate into the batter. Once the chocolate is evenly distributed, transfer to the prepared baking pan and use an offset spatula to smooth the top. Bake in the preheated oven for 30 to 35 minutes, or until the edges of the blondies are set but the center still looks a little gooey (the blondies will continue to cook in the pan). Allow to cool on a wire rack slightly before consuming in all their delicious glory. Don't forget the milk!